LIGHTWEIGHT! SLEEPS 4! WELL EQUIPPED! JAYCO......THE NAME YOU KNOW! The New Travel Trailer - 2018 Jayco Jay Flight SLX 175RD you are looking for is already out camping! 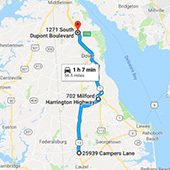 Here are some similar units from Delmarva RV Center in Smyrna that you might enjoy!